One of the many challenges faced by importers and exporters in International Trade is the sheer amount of paperwork. A recent study by Maersk calculated almost 200 separate forms were required for a simple shipment of flowers from Kenya to the Netherlands. Contracts, licenses, declarations, and documents are always needed to import and export goods. One of the many challenges faced by importers and exporters in International Trade is the sheer amount of paperwork. A recent study by Maersk calculated almost 200 separate forms were required for a simple shipment of flowers from Kenya to the Netherlands. Contracts, licenses, declarations, and documents are always needed to import and export goods. Many businesses can use the services of a freight forwarder or agent but need to remember they are ultimately responsible for making sure the correct papers are submitted themselves. Blockchain-based smart-contracts have the potential to make this whole process a lot more efficient. The technology can remove at least one-half of all documents, and every transaction is automatically entered into a decentralized database. Smart contracts are yet to be applied everywhere, so in the meantime, companies must fully understand what’s needed beforehand to minimize extra costs. Emurgo VC is a company based in Japan who can consult others on how to best use blockchain. It is daunting for people from a nontechnical background to grasp how distributed ledger technology can improve their business. Importers, exporters, government workers and agents need to be educated properly on how to utilize what Emurgo and sister companies IOHK / Cardano have on offer. The Cardano ecosystem, as it’s known, was founded by Charles Hoskinson in 2017 and boasts an array of interesting services for businesses working in International Trade. Written with a programming language called Haskell, the coin is named Ada and decisions are made via a proof-of-stake algorithm called Ouroboros, instead of a proof-of-work system. Its technical stuff I know, but any person or business who wants to look into this further should not be put off by that. Emurgo is very approachable and can communicate complicated technical jargon into something customers are able to understand and see the benefits of. British companies need an Economic Operator Registration and Identification (EORI) number to trade goods with countries outside the EU. This is usually passed on to a courier or freight forwarder who can then present it to make customs declarations (both import and export). The number is also used by authorities when exchanging information between themselves and government departments/agencies. It is a way to allocate resources and record interesting data about the movement of goods. This a perfect example of how certain technologies could not only speed up application processes but also drastically reduce paperwork. Once integrated into a blockchain, data like this can flow freely and is immutable. 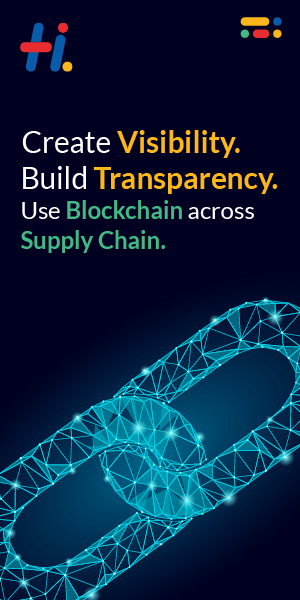 Some companies like Modum.io and Smart Containers are going one step further by using AI to further improve supply chains with information like EORI numbers. As Brexit looms, companies are about to experience complicated changes in import and export duties, especially when dealing with faraway places like Africa and South America – rules of origin being one of them. Certificates of origin, typically provided by chambers of commerce, are needed to prove where goods were made for customs purposes, all of which can be digitized and recorded on a distributed ledger. Companies like Emurgo consult organizations on matters such as this and provide innovative solutions. It will take time for these technologies to be everywhere but they have already made an appearance in customs. Earlier this year a business chamber in south-west England certified an export consignment from an engineering company using blockchain. Companies have also adopted it to monitor cargoes, such as the shipping group Maersk, but the whole process involves a great number of smaller traders whose processes need to be digitized as well to make solutions work. This is an excellent business development and sales opportunity for the likes of Emurgo. Importing to the UK from Africa usually requires an export partner in the corresponding country, for instance, Ethiopia. The Addis Ababa Chamber of Commerce can advise companies on all aspects of the export business including lists of eligible export goods, export documentation, bank payments and customs procedures. The Everything but Arms Initiative grants full duty-free and quota-free access to the EU Single Market for all products (except arms and armaments). The right export documentation is critical here as, without it, products can’t clear customs. Goods stuck in customs are not stored free of charge and it is the exporter or seller who pays this. Most of all, papers must be accurate so the opportunities for blockchain technology here are exponential. It will provide much-needed security, safety and also cut costs drastically, especially when it comes to bank charges. There are four compulsory documents when transporting goods from somewhere like Ethiopia into Europe. A Certificate of Origin (CO) is the document attesting goods in a shipment were obtained, produced, manufactured and processed in that specific country – the country of origin. Goods such as these often enjoy incentives like duty-free tariff treatment so it’s worth keeping this in mind when buying. Another important document is a commercial invoice, which is prepared and provided by the exporter or seller to the buyer or importer. It needs to be seen by customs in both countries and include information such as a description of goods, number of the invoice and date, country of origin, unit and the total price of goods, plus T&Cs. This is where the exporter makes their money – so commercial invoices need to be carefully put together and be agreed on by both parties. Smart invoices are similar to smart contracts but instead, companies can upload them onto a blockchain. Once on there, these smart invoices can access both payment due date and the amount that’s due. With this information, digital invoices automatically identify the network of companies trading with a given client. Whenever a company is not paid by a client at the due date, smart invoices make a decision, according to the rules implemented at inception, whether or not to send an alert to other suppliers telling them the buyer is insolvent. Similarly, when the company starts paying again, smart invoices can inform companies the client is safe to trade with. This is just one example of how smart contracts can make invoicing quicker and more efficient. A bill of lading (B/L) is the document issued by a carrier (such as shipping or air freight company) to acknowledge receipt of cargo. This requires the most paperwork, especially if there are lots of carriers in a supply chain such as lorries and warehouses. With blockchain technology, importers can be informed of what’s going on at every stage. One of my favorite companies called Modum.io are making great innovations in this space, and combined with IoT; services also extend to the care in which a product is transported e.g. temperature en route. Smart contracts are signed and agreed at each point, which solves two major pains – speed and cost. Finally, packing lists are similar to an invoice but don’t mention prices. They include information such as weight, dimensions, and quantity; before and after packing. A similar model to smart invoices can be applied here. When importing goods from Africa into the EU, companies need to find out the correct commodity code for tax and regulations. There are many to choose from so by applying for what’s know as a Binding Tariff Information ruling (BTI), it is a lot simpler to pinpoint which code needs to be used and how much duty must be paid. The Gov.uk website has an email address where people can send information regarding what their product is made of and its function. The system is almost archaic and could benefit from some cool new technology. Another complicated task is declaring imports to customs and is only suitable for experienced importers, so should usually be handled by a courier or freight forwarding agent. That being said, with the right platform and user experience design, declaring imports could be made a lot easier. Blockchain and smart contracts can secure and speed up tedious administrative jobs like this, cutting out the middle-man and saving costs for importers and exporters. In the UK, VAT it is paid directly to HM Revenue and Customs (HMRC) on goods when they first enter the country. The C79 form is a certificate issued by HMRC proving it has been paid and can be reclaimed. While blockchain is not the cure for all VAT related problems, it could be applied in a number of areas to reduce administrative burdens. PWC has been researching how technology can improve VAT collection and modernize a system which was designed decades ago. Blockchain makes fraud and errors far easier to detect because the system provides clear and transparent information on transactions. This could be particularly useful for tracking if and where VAT has been paid, and in doing so reduce VAT fraud. It can also make accounting a lot easier for private businesses, and companies such as Balanc3 and TaxToken offer good financial solutions in this space. British Government departments are already researching into how blockchain and distributed ledger technology can transform the delivery of public services and boost productivity. Similar to the blockchain, the distributed ledger is a database that can securely record financial, physical or electronic assets for sharing across a network. It can provide the government and private companies with new tools to reduce fraud, error and the cost of paper-intensive processes. The technology also has the potential to provide new ways of assuring ownership and provenance of goods and intellectual property. Any new technology creates challenges, but with the right mix of leadership, collaboration and sound governance, distributed ledgers could yield significant benefits for the UK. The documents mentioned in this article are just a few examples of what is needed on a daily basis from importers and exporters. Now is the time to look for blockchain solutions as within a few years it will be everywhere. Administration in International Trade is a costly and lengthy process so new innovations will be welcomed with open arms. Getting consultancy is the first step to making good choices in this space. With so much technical jargon and companies to choose from, it can be difficult to know where to start. Emurgo can point you in the right direction and not only give advice but actually design and implement the technology to improve business processes.